Libraries use classification systems to organize the books on the shelves. A classification system uses letters and/or numbers (call numbers) to arrange the books so that books on the same topic are together. This arrangement results in "serendipitous browsing:" you find one book in the catalog, go to the shelf, and, an even better book is sitting right next to it. Libraries in the United States generally use either the Library of Congress Classification System (LC) or the Dewey Decimal Classification System to organize their books. 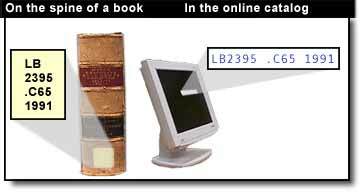 Most academic libraries use LC, and most public libraries and K-12 school libraries use Dewey. The first two lines describe the subject of the book. The third line often represents the author's last name. The last line represents the date of publication. Here is a shelf of books with the call number order explained.